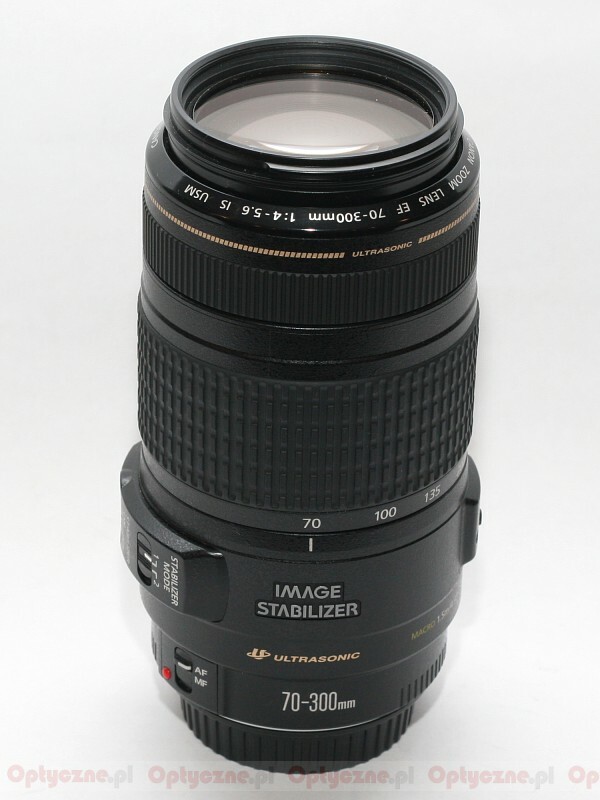 In September 1995, Canon introduced the world's first DSLR telephoto zoom lens equipped with picture stabilization - the Canon EF 75-300 mm f/4-5.6 IS USM. 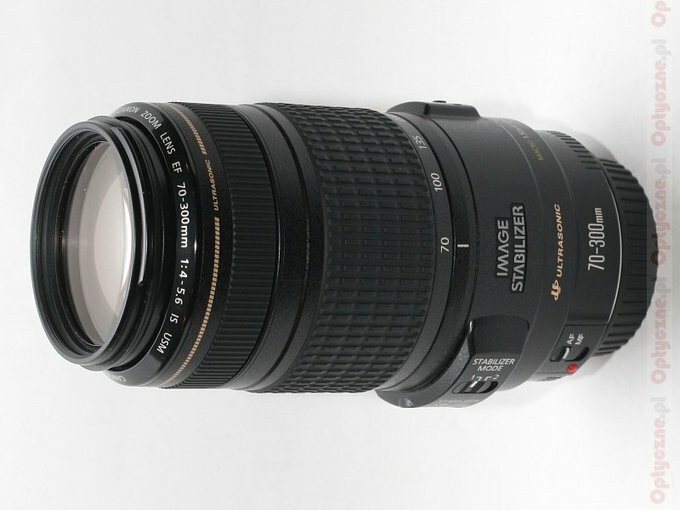 The lens had lots of admirers thanks to its good parameters and picture stabilization. It raised, however, some doubts as far as picture quality is concerned. All the doubts went away in October 2005 when Canon introduced the new 75-300 IS USM model. The new lens had the same light, but 5 mm longer focal length (now it starts from 70 mm), as well as more efficient stabilization and UD glass in one of the optical elements. All these additions did not influence the price. The start was somewhat painful. First we waited a long time before the lens appeared on the Polish market. When it finally appeared, the stabilization in several units did not work correctly. The problem appeared when working with a body put vertically and with the focal length set to 300 mm. As a result, the imperfect stabilization worsened the picture quality. In June 2006, both the American and Japanese Canon headquarters announced that the error appeared only in lenses with an 8-digital production number having a 0 or 1 in the third digit. The lens supplies quickly disappeared and the new ones never showed up. This problem still exists, as even in big online stores this lens is still unavailable. The most shameful part of this whole episode is the behavior of Canon Poland. In June, after the error lens information became public, we sent an official email to Mr. Robert Wozniak (Product Manager) and Ms Izabela Rogulska (Corporate Communication & PR Representative) asking for an explanation of the whole situation. We did not receive any reply. After about a month we started receiving emails from our readers saying that they were told that Canon Poland never found any error in the Canon 70-300 IS USM and the lack of those lenses on the market is caused by its great demand. We sent another official email asking for an explanation. Throughout August we tried to contact Mr. Wozniak and Ms. Rogulska but without success - no reply to our emails; they did not answer our calls and when we tried to contact them through the Canon Poland office they were always unavailable. They went to even greater extremes when the new Canon 400D was introduced. The new camera was provided to all our competing product reviewers, but we still did not receive any answers to our multiple phone calls or emails. After this we wrote an official letter to Canon Europe asking for an explanation about Canon Poland's behavior and about the Canon 70-300 IS USM. This finally worked and the next day we received a polite letter from Ms. Rogulska explaining some of the problems (for example that Canon Poland has only ONE camera available and the priority goes to the hardcopy reviewers) but still nothing was said about the 70-300 IS USM. Being encouraged by Ms. Rogulska's letter to ask questions and her promise to have those questions answered, we wrote another letter about the fatal 70-300 IS USM. We are still waiting for the answer. We are sorry for the somewhat lengthy introduction but we think it is worth mentioning that for such a serious brand as Canon, there are national branches that do nothing. 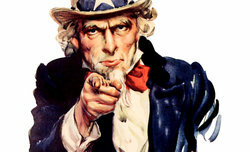 What are the product marketing and PR specialists paid for? You cannot find any Canon adds, the firm is absent at any national trade fair or exhibitions and the customer service practically does not exist. Additionally, Canon Poland constantly ignores our Internet portal, which is visited monthly by more than 30,000 readers and is the only Internet portal which publishes professional lens tests in Polish. Too bad. To finish the introduction on an optimistic note, we have good news. 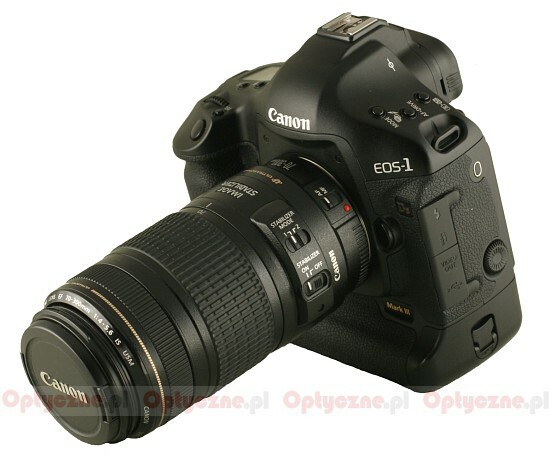 Thanks to its great supply sources, the store Cyfrowe.pl managed to acquire a Canon EF 70-300 IS USM for us. Its third digit production number is 3, which means it is free of the error. Thanks to this we can present the results of our latest test of the Canon EF 70-300 IS USM. Enjoy the review!